When Macomb County learned it would get a little more funding for roads this year from the state it put out the call to local communities asking if they would provide matching dollars for to improve their roads. Shelby Township took the opportunity. On April 16, the township’s Board of Trustees is expected to vote on whether to follow through on a plan to committ $8.3 million to multiple road improvement projects over the next two years, which will total more than $20 million in new and improved roads throughout the township. 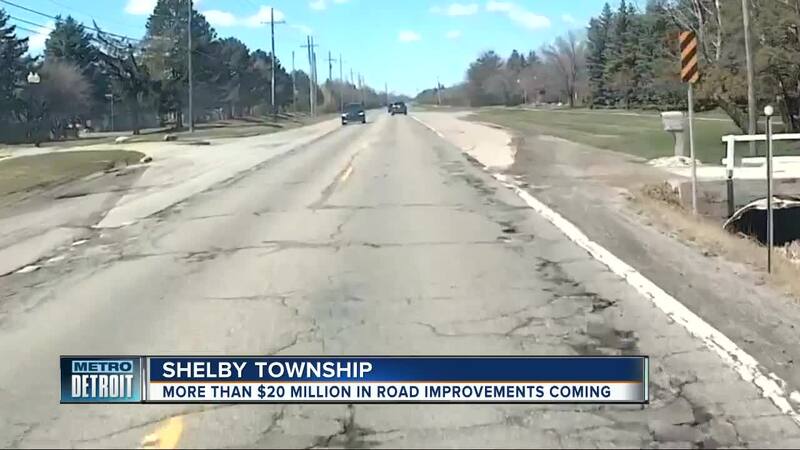 SHELBY TOWNSHIP, Mich. (WXYZ) — When Macomb County learned it would get a little more funding for roads this year from the state it put out the call to local communities asking if they would provide matching dollars for to improve their roads. Shelby Township took the opportunity. On April 16, the township’s Board of Trustees is expected to vote on whether to follow through on a plan to commit $8.3 million to multiple road improvement projects over the next two years, which will total more than $20 million in new and improved roads throughout the township. Under the plan as it stands right now in 2019 crews would fix the following projects. Repair and overlay of 21 Mile Road for its entirety from Shelby Road to Hayes Road. Repair and overlay for 22 Mile Road from Shelby Road to Hayes Road. A concrete repair of 23 Mile Road between Schoenherr and Hayes Roads. Repair and overlay work on Shelby Road between Mound and 23 Mile roads.Repair and overlay work on Shelby Road between 25 Mile Road and the entrance to Stoney Creek Metropark. Mound Road will get a facelift with repair and overlay work between Westmoor Drive and 26 Mile Road.Ryan Road will be addressed with repair and overlay between West Utica and 22 Mile roads. The subdivision streets Starlite Drive and Woodmire Drive would be improved. Under the plan in 2020 crews would fix the following roads. 23 Mile Road between Shelby and Mound roads. Mound Road between the M-59 Expressway and Auburn Road. Dequindre Road between West Utica and Auburn Roads. The 23 Mile Road and Shelby Parkway/Corporate Drive intersection would be widened and improved just east of the M-53 Expressway. Macomb County Executive Mark Hackel warned that the county has so many miles of road in need of attention - fixes are being done in thrifty - for now - ways. Hackel says the county recently did a study of all county roads. It found there are 803 Lane Miles of Road in Macomb County that need to fixed right now. Fixing them will cost $1.2 billion This is a problem. Starting in 2021 Macomb County will get only about $60 million for roads. It would take about 20 years to fix the roads in need right now.